In 2015, more than 2 million cargo containers moved through the Port of Oakland. After those containers are offloaded from cargo ships, they are stacked onto large decks until they can be loaded onto trucks, trains or ships and shipped out. 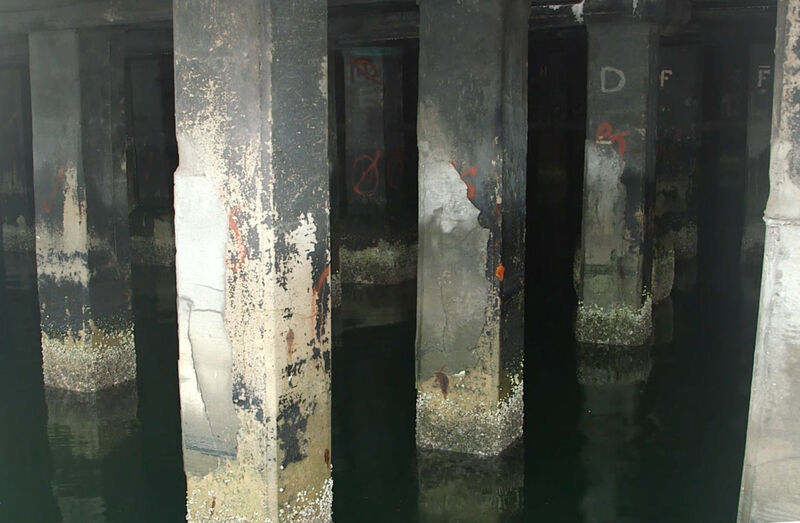 Those decks are essentially massive piers, built over water on thousands of vertical concrete supports called piles. These piles — approximately 28,000 of them — are the critical unseen system that supports all cargo activities at the port. This critical pile system is managed and maintained by a small team of four divers, who spend most of their time inspecting and repairing them. Most of the piles at the Port of Oakland are made of concrete with steel rebar cores. The piles stretch 60 feet from the terminal deck down into the water, but their actual length is much longer, as they are embedded deep into the mud at the bottom of the bay. One gray morning in December, as Nekimken prepared to dive into the water and perform a pile inspection, he discovered evidence of the damage caused by saltwater on his dive suit. The communications line that connects the suit to the boat had been infiltrated by water and corroded the electrical leads. Nekimken quickly cut out the rotted bit of the wire and reattached the communications line to his dive helmet. Nekimken then put on a thick neoprene dry suit before attaching his dive helmet. Commercial divers like Nekimken do not wear the iconic compressed air tanks like recreational scuba divers. Instead, they use bulky dive helmets that encompass the whole head. 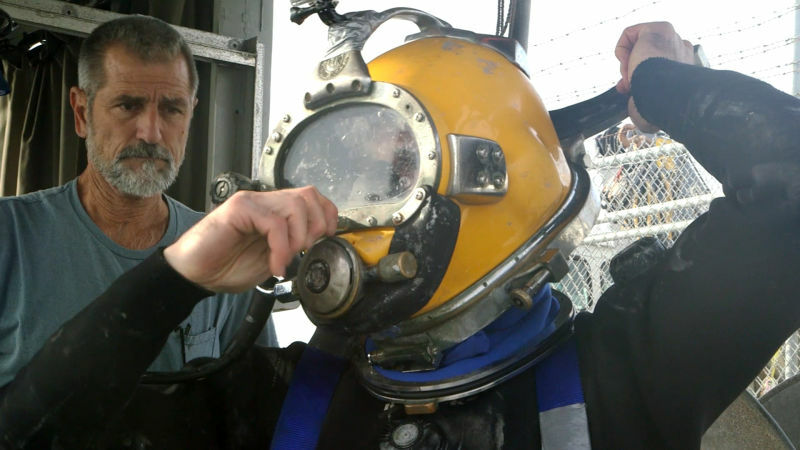 These dive helmets receive surface-supplied oxygen from an air compressor on a boat. This allows divers an unlimited supply of air. Nekimken said that it’s not uncommon for divers at the Port of Oakland to be underwater for as long as six hours without surfacing. After putting on the dive helmet and attaching the compressed air hoses and communications cables, he jumped into the water. As Nekimken sank into the bay and made his way to the back of the boat, his colleague, Sean Wheeles, was watching his back. Wheeles is also a diver for the port, but that day he was operating a robotic underwater vehicle called a VideoRay. The VideoRay is equipped with lights, a camera and sonar capability. Wheeles controlled the submersible from a laptop on the surface. He was able to provide a bit of extra light for Nekimken and monitor his progress from the boat. A few minutes later, Nekimken resurfaced at the back of the boat. Dive supervisor Donald Ockrassa unceremoniously dropped an important tool into the water for Nekimken, a power washer. Nekimken submerged and made his way to a nearby pile. 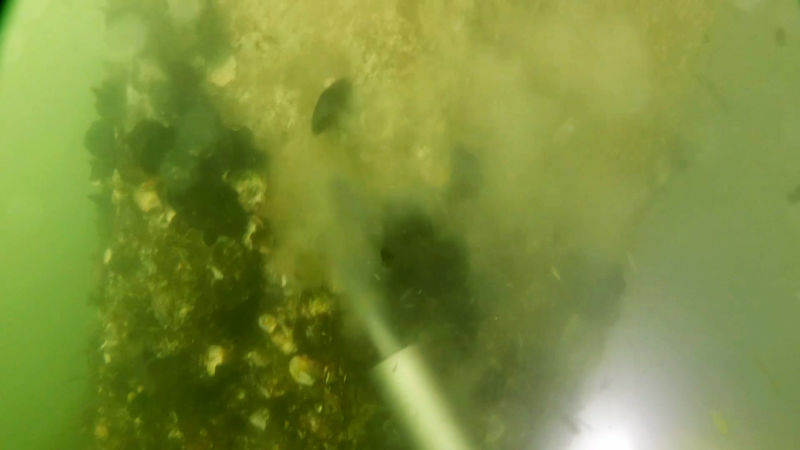 Near the surface, the pile had a light coat of green algae. The power washer made quick work of the algae, but as Nekimken moved deeper into the water, the growth on the pile was more significant. Closer to the mud line at the base of the pile, Nekimken found thick clusters of barnacles and mussels. As he sprayed the thick growth near the bottom, the water clouded darkly around him, and he lost visibility. Once the pile was cleaned of growth, Nekimken was able to inspect the surface of the pile for fractures. The concrete piles can be easily fractured during an earthquake. These small fractures are not an immediate concern, as the rebar inside the pile will still hold it together. The danger lies in the slow process of saltwater seeping through cracks and reaching the steel rebar inside. The saltwater slowly corrodes the steel, which over time begins to swell, further cracking and weakening the strength of the pile. If divers discover a pile with hairline fractures, they can easily seal them on the spot. If they find a pile with significant damage, they will return later, surround the pile with scaffolding, and pour fresh concrete around the damaged pile. Nekimken didn’t find any fractures that morning. He resurfaced after about an hour, making it a very short dive. He climbed up a ladder on the back of the boat, and his fellow divers helped him remove the suit. He squeezed dish soap into the neoprene suit to make it easier to remove. As Nekimken struggled to get out of the tight suit, Wheeles packed up the VideoRay. With thousands of concrete piles slowly degrading in the saltwater, regular fracturing created by earthquakes, and increased shipping activity at the port, Wheeles is right. 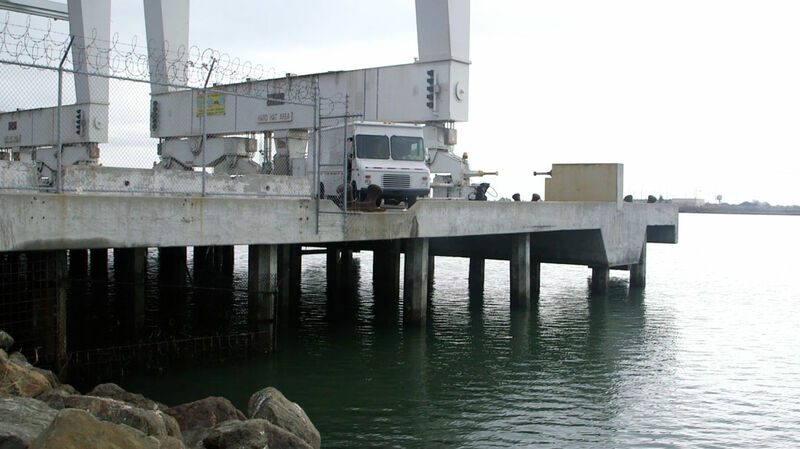 The dive team at the Port of Oakland will never run out of work.